The AGM is proud to partner with Y+ contemporary to present this exhibition. Y+ contemporary is an artist-run space based in Scarborough, co-founded in 2015 by Danièle Dennis, Daniel Grif n Hunt, Dorica Manuel and Tiffany Scho eld. Y+ aims to provide an inclusive platform for artistic production, engagement, and experimentation, with a focus on emerging practices. Hiba Abdallah has lived most of her life in Windsor, Ontario, a city that has heavily influenced her interest in the converge of art and social practice. She is part of the artist collective Broken City Lab, which was long-listed for the 2011 Sobey Art award. She completed her BFA at the University of Windsor in 2012 and her MFA at the University of Guelph in 2017. Remember. The word is expressed as an imperative, imploring us to recall a past experience. The will to remember is the reason for the existence of souvenir shops, those proverbial retail locations filled with products created for the specific purpose of remembering a place. Objects are emblazoned with iconic texts and images: city names, official logos, and prominent architectural features. For suburban cities like Mississauga, these defining features are often entwined with commercial enterprise. Large regional shopping malls are where most suburban city centres find their origins, with city halls and municipal offices built alongside these planned developments. The result is cities whose identities have come to be associated with commercial endeavours. In this exhibition, Hiba Abdallah considers the commemoration of place through the lens of a souvenir shop. 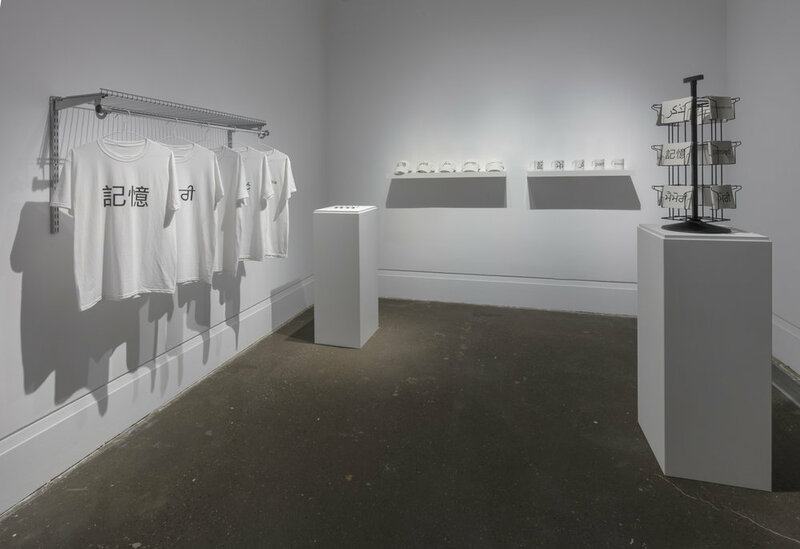 Constructed to resemble the titular shop, Abdallah presents a series of objects: mugs, pens, postcards, hats, and t-shirts. 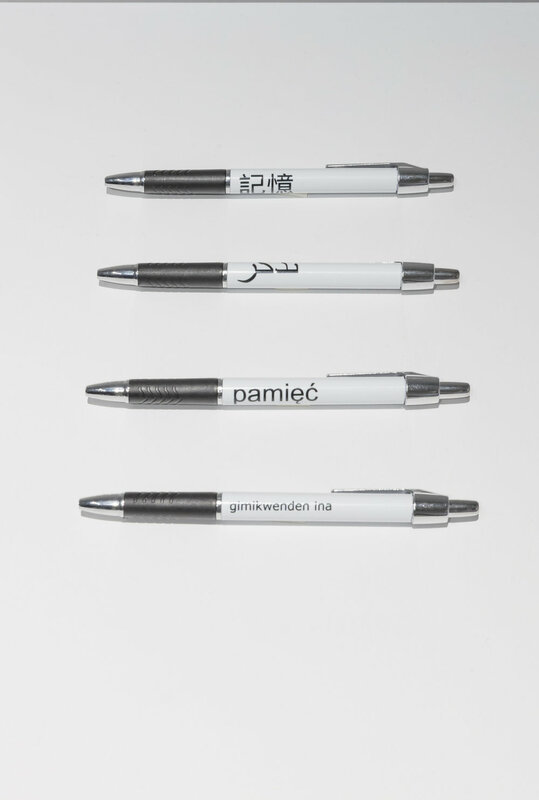 In place of official logos, each object bears the word remember, printed in a stylized text translated across five written languages: Chinese, Punjabi, Arabic, Polish, and Anishnaabemowin. The first four are among the most common native languages of Mississauga residents; Anishnaabemowin is the language of the Anishinaabe who are the Indigenous peoples of this land. Only in Anishnaabemowin is a question directly posed: Do you remember? What we are being asked to remember is not made explicit, and each translation imbues the request with different connotative weight. The negotiation of this ambiguous space between languages unsettles established narratives of place. Abdallah engages in what art historian Grace McQuilten has termed mis-design, an attempt to "harness the process of design to misdirect commercial production." An imitation of the neighbouring commercial landscape, the installation utilizes the visual strategies of retail design to subvert the function of objects in a gallery setting. A pop-up shop aesthetic positions the objects as take-awats that could be replenished or replaced, possibly in response to the city's changing demographics. Abdallah brings an acute awareness to the multiple communities who are present here, and the histories of immigration and colonialism that have shaped this city. 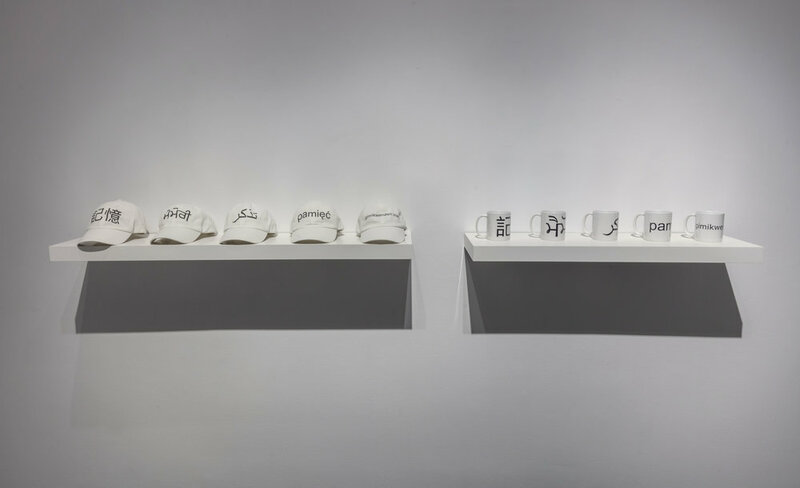 Abdallah frequently works at the intersections of conceptual art and social practice, and here, her installation confronts us with the use-value of the objects on display and their role in the creation and promotion of civic identity. 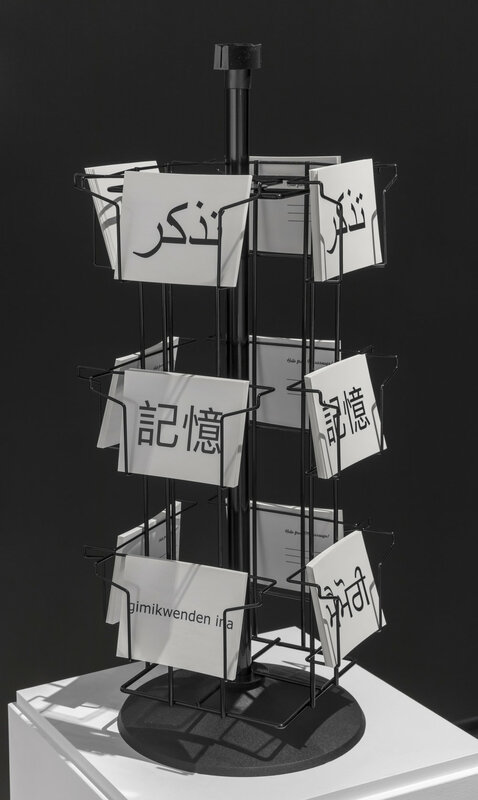 For those not fluent in any of the featured written languages, the text serves as a visual signifier of the city's multilingual landscape, accruing meaning through shifts in script in alphabet. Moreover, the circulation of products - a borrowed pen, a proudly worn hat - has the potential to be transformed into a communications network, with the text adorning each object acting as a beacon to others who share a mother tongue. Souvenir Shop proposes a re-envisioning of Mississauga's identity, in it's citizens' own words. 1. Grace McQuilten, Art in Consumer Culture: Mis-design (Fanharm UK: Ashgate Publishing, 2011), 43. Souvenir Shop, XIT-RM, Art Gallery of Mississauga. Photo by Toni Hafkenscheid. Image on reverse: Hiba Abdallah, Remember Mug, 2017, computer rendering (detail). Courtesy of the artist.